It’s sad, but expected in a way, when elected representatives are spineless and cowardly do-nothings. That’s what America has in the personages of Midget Mitch McConnell and Dumb Donald J Trump, the Great Orange. What was it he said to Chuck Schumacher in the Oval Office? ► Trump owns the shutdown. He said he would “own” the government shutdown. He would not blame the democrats for it. Yeah, right, how long did that last? When I see people, such as Mitch and Donny, I truly grow dysphoric, as they represent the lowest and worst of America and Americans. What heightens my despair is the knowledge the only reason they are able to damage our nation is that people actually voted them into office. That’s just sad. Yet, at the same time as we see the worst of the worst, we also see the best. 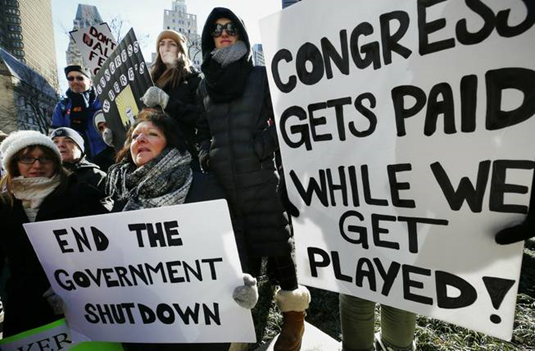 As I write this column, the government shutdown has been going on for more than a month and many, many women and men are hurting, as the government remains idle. Yes, those in need of non-existent services are hurting, but those facing the worst hardships are the workers. Pity we don’t force the members of Congress to go without pay until they resolve this issue. If that were the case, a full budget would pass in a single day. As that is not the case, and as Trump does not care one iota about these workers or our nation, he is not going to offer any sort of meaningful solution to the problem, ever. ► People complain of the government. Now, it’s as regular as death and taxes to point out the shortcomings of the government, but that’s easy when you think of it as just this huge nameless faceless bureaucratic entity like in the movie Brazil. Where we run into trouble is when we see the people who actually perform the tasks of governance. That’s when we confront the sad truth; they are we. Right now, government workers and those working for government sub-contractors are hurting. This is also when we see what’s truly great about America. Over the course of the last several weeks, I saw numerous acts of kindness, by people and businesses here in Central Florida and elsewhere, which directed toward these government employees. I saw food banks prepare bags of groceries and workers line up to get them. Charities give out gas cards so workers can fill up their tanks and get to work, to a job they do without pay. Such acts of kindness ease and even diminish my despair for a simple reason, the sheer numbers are a promise of hope. The morons in Washington that are causing all of our problems are countable on the fingers of one hand. All of the people who are putting forth genuine effort to help all these workers in need are easily several thousand, and that is what makes all the difference. ► Kindness is a nice first step. That’s when I smile and have hope for the future. I know things are still tough, I know we’re far from unified and working to improve our country as a whole, but it is a nice first step to see people stepping up to the plate to help their fellow Americans in these bad times. Now, if the people at the top could just take a lesson from the rest of us.